It was the day of the birthday dinner. I had spent most of the previous evening lying awake trying to work out the best timing for all of the dishes and their components. Although the cauliflower panna cotta only required a spoonful of caviar to finish before serving, I had to blanch and shock asparagus just as the guests arrived, and I had to drop the eggs in the water bath half an hour before that. I would be relying heavily on my oeven and its warming drawer to hold components until ready for assembly. 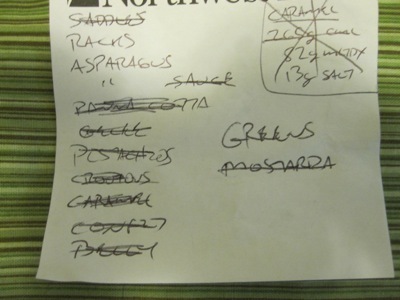 I tried to remember to take photos whenever I could, but things were a bit hectic in the kitchen, so some steps aren’t documented. To finish the rutabaga mostarda, I drained the vacuum bags with the slices and syrup and strained the liquid into a saucepan. I boiled the syrup to reduce while I cleaned the slices of any stray bits of mustard seed or horseradish. Once the syrup was reduced to a glaze, I added fifteen grams of butter, stirred in the slices, and held the mixture in the covered saucepan. To finish the potato “mille-feuille”, I unmolded the compressed potato cake from the loaf pan and cut it into rectangles about an inch square and an inch and a half long. I didn’t pay attention to the final orientation of the potato layers, so I wound up with potato rectangles in which the layers progressed from left to right across the plate instead of top to bottom. I crisped the potatoes in clarified butter until they were brown on all sides, then glazed with the butter. I held the potatoes in the warming drawer. 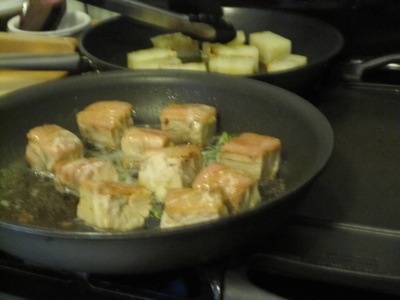 To finish the pork belly, I cut it into inch and a half cubes which I crisped in a saute pan filmed with canola oil. When the belly was browned on all sides, I removed them to a rack to drain, and held them in the warming drawer. 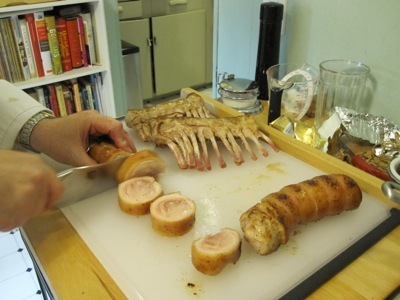 To finish the racks and loins, I covered the bones of the rack with foil to keep them from discoloring, then filmed a (second) saute pan with oil. 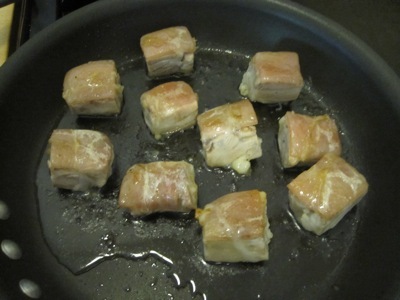 I added the rolled loins over medium heat and cooked for about six minutes, turning the loins so they cooked evenly. I added the racks meat side down and turned up the heat to brown the meat. I added thirty grams of butter, turned the racks over, and butter basted the meat for about two more minutes. Finally, I removed the racks and loins to a rack to rest. To finish the leg and shoulder confit, I cooked them skin side down for three minutes before moving them to a 350 °F oven for another six minutes with a flip halfway through. 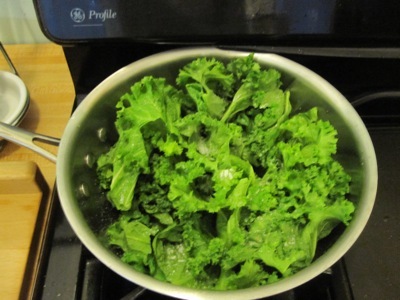 To prepare the mustard greens, I added them to a saucepan with twenty grams of butter, a pinch each of salt and sugar, and cooked until they wilted. I added a cup of chicken stock, brought it to a boil, and simmered the greens for ten minutes. Assembly time: I laid down a spoonful of pork sauce (did I forget to mention the “quick” pork sauce that took me eight hours to prepare while I was sous vide-ing the confit? 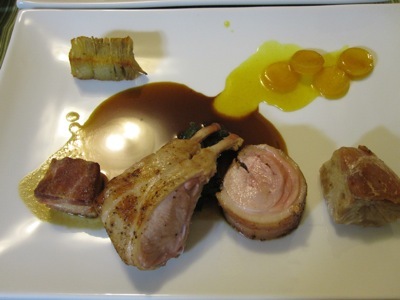 ), set the mustard greens in the center of the plate, and placed a potato baton, a cube of belly, and chunk of confit in three of the corners. I cut the loins into thick slices and the racks into double chops with two bones each. I placed the loin slice next to the confit and draped the rack over the greens. 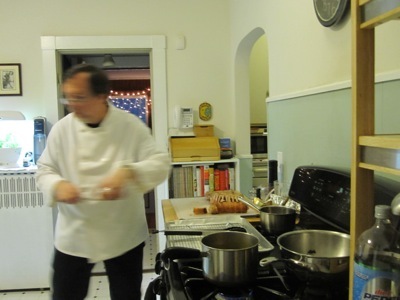 I was plating on a table opposite the stove, somehow managing not to drop anything. 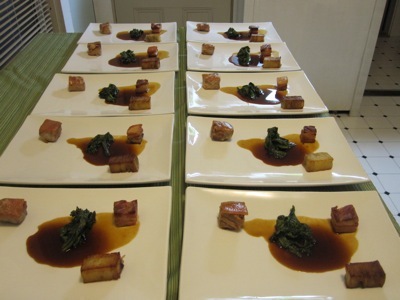 The rutabaga slices and glaze were placed in the last remaining corner, and the plate was finished. 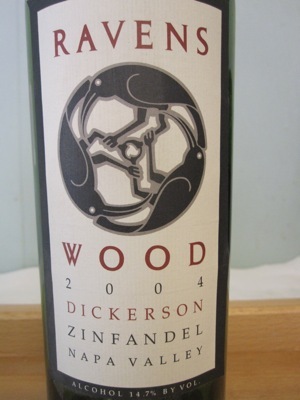 I served the dish with a 2004 Ravenswood Dickerson Napa Valley Zinfandel. How did it taste? Crispy fatty belly, salty confit, tender chops, perfectly cooked loins, bitter greens, sweet and spicy mostarda, and rich meaty sauce: this dish hit every note. The plates I returned to the kitchen were wiped clean. This was undoubtedly the most technically complex dish I have ever cooked, but it was so clearly worth it. If I ever do it again, however, I will need an assistant at service time to get the plates ready and pull the components together quicker. I don’t think He Who Will Not Be Ignored is ready just yet. And I will spend a bit more time writing out the final plating steps instead of committing them to memory and using shorthand.